Jeff Hafner and his father Earl run Early Morning Harvest Farm in Panora, Iowa. The father-and-son pair has run the organic farm since 2000 on a piece of land once owned by Earl’s father. In the last decade, the farm has expanded to include not only a cattle herd and traditional row crops, but 200 or so free-range chickens, a flour mill to process grains grown on-site and an aquaponics business that grew out of an evening hobby. The farm is currently breaking even, and that’s only because the need to hire a full-time aquaponics worker cut into the profits. The flour mill was added to this multi-generational farm in 2012 to meet local demand for processed grains, enabling the Hafners to sell wheat-, corn- and rye-based flours online through the Iowa Food Coop and at farmers’ markets around the region. The Hafners are currently in negotiations to take his prepackaged products to grocery stores in four states. Amidst the mass of Iowan corn growers, Early Morning Harvest Farm offers a diversity of organic products including a variety of grains, certified organic beef, local honey (through a local producer that houses 200 hives on the farm), live tilapia, fresh herbs and year-round vegetables harvested weekly in the aquaponic greenhouse. The farm supports three full-time staff members. 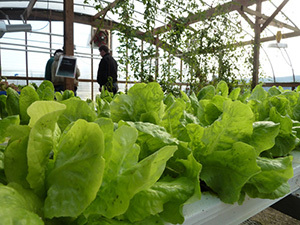 “When I started aquaponics, I had a steep learning curve,” admits Jeff Hafner. A fan of experimentation and a self-confessed “recreational thinker,” Hafner uses three main processes: growth media-filled beds, nutrient film technique which passes a shallow stream of nutrient-rich water past plant roots, and the Nelson and Pade system developed at the University of the Virgin Islands. In this closed system, water circulates between a series of fish tanks connected to filtration beds, which allow the plants to clean the water before it is recirculated back to the tanks. This system is Hafner’s favorite for commercial growing. Hafner recommends simple media-filled beds for the hobbyist or homeowner. Early Morning Harvest sells the bulk of its products to area grocery stores, restaurants and bakeries. Hafner found simply meeting with local business owners and telling them the product was available was the first step in creating a commercially viable aquaponics business. Hafner sees expansion of the Early Morning Harvest brand as a way to accelerate marketing opportunities and increase his customer base. “Don’t put all your eggs in one basket,” he advises, noting that diversity and sustainability complement each other and staying viable means constantly thinking up new ways to improve. Although he’s still trying to figure out how to keep his pasture-fed chickens from being ravaged by the local raccoon population and hasn’t decided which solar-powered system should heat his aquaponics greenhouse, Hafner has a strong start on building a sustainable enterprise in the Iowan corn belt.